Are you looking for that ideal office retreat? Then the Houston Mill House with its ideal location near Atlanta Georgia and historic ambiance is you perfect solution. Allow our staff to create that unique event especially tailored for your company. Need the most up to date audio-visual equipment, custom coffee breaks, or a special luncheon? Our experienced catering manager can handle all of the details. 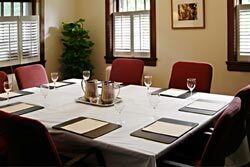 Houston Mill House is the destination for all of your conference needs. 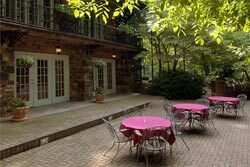 The Houston Mill House has a main meeting room that accommodates up to 40 participants as well as 4 breakout rooms for 10 people each. The garden and lawns are available for teambuilding. To arrange a site visit of Houston Mill House simply call our Catering Manager at 404-712-6712 or click here to request a proposal.